Man, it's hard to keep up a blog when your amazing experience in New Zealand is ending soon and everything is happening and you have exams and you're trying to spend as much time as possible with everyone you love before you have to say goodbye to them for a long time. It's a little late, but here's a recap of my last "big adventure" in NZ. When classes ended we were given a week-long "study break", so naturally, my friends and I took the opportunity to explore a bit more of the North Island. We did all of our traveling by hitchhiking and we were very lucky with all of our rides. We made the six hour drive up to the Coromandel Peninsula in just three rides! We didn't quite have our sleeping situation planned for that night, so our last ride generously offered for us to camp on her dairy farm in Tairua. That was so nice because otherwise we'd be on foot with huge backpacks, looking around for some place to camp in the dark. Feeling very lucky, the three of us pitched our two-person tent next to the cows. Shep's house was so awesome. He hosts couchsurfers and WWOOFers from all over the world. He has friends in so many countries and the interior of his house really shows it. Most of his furniture and dishes are handmade by himself and the people who visit. His walls are filled with artwork done by friends and he has a woodstove and a piano. What more could you ever want in life? We had a feast for dinner of extremely delicious pumpkin soup (my new favorite food), chicken, French bread, pizza, and muscles. P.S. dinner is definitely not in the job description of a couchsurfing host. We also had surprise visitors: two of the neighbors cows and one of Shep's new baby goats were loose in his yard so we all had to make a human wall and guide them to their rightful homes. I always have to laugh at the crazy situations we get ourselves in. We stayed with Shep only one night, then we had to hitch to Auckland for the weekend because Lisa and I had tickets to see the All Blacks vs. England rugby game. But before the game, we had fun exploring the city with our lovely hostel-mate, Ahmed. The rugby game was the first of three games in the Steinlager series. It was incredible! The players were HUGE up close! The strongest men I've ever seen. 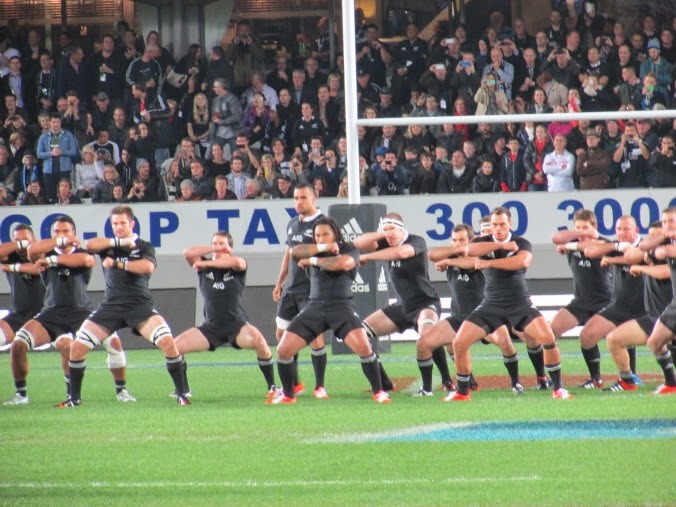 And when they did the haka... so intimidating. We were told the All Blacks would win by a long shot, but the game ended up being really close. But yes, the All Blacks won and New Zealand exploded with pride and joy. The game is very physical and played without padding or helmets. The All Blacks are coming to Chicago on November 7th to play The Eagles. (I didn't even know we had a rugby team!) I really hope I can make it to that game!! !